Connor climbed up the stairs! Connor climbed up the stairs this morning! I almost had a heart attack. It came out of nowhere as we only just introduced it in PT last week. We hadn’t even really worked on it yet. Sure, he goes over to the stairs and props himself up with his arms on the step. 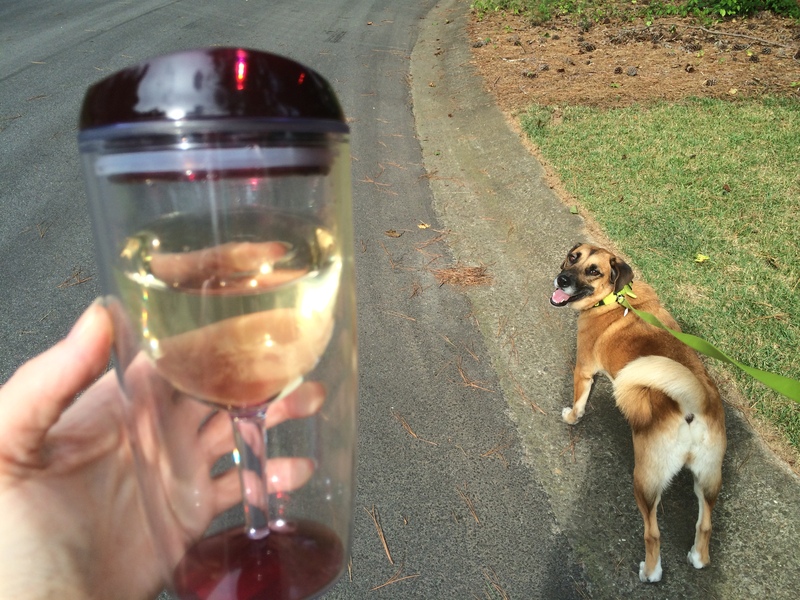 He’d even managed to go up one with assistance. But today I was on my computer and I glanced over to the stairs and there he was on the second step. I gasped and ran to the bottom in case he fell, but he just kept going. I did a whisper yell to get Chris out of his office, but not wanting to startle Connor or stop him. He would have gone all the way to the top but Chris stopped him since we are painting (ahem, correction, he is painting) the bedroom and there is stuff all over. Just this week we had his IFSP meeting with his early intervention team to check his progress and set new goals. His physical therapy goal he was to have met by now, set based on the speed with which he met previous goals, was to be sitting independently with hands free for play. 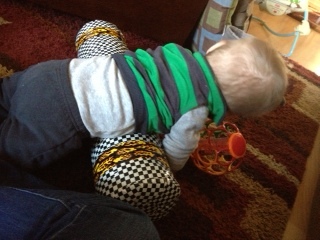 Instead he surpassed that and started crawling, pulling to stand and cruising. And now climbing the stairs! Here is video of a repeat performance. I’m wigging out like I just did 27 espresso shots. What are all these baby torture devices? 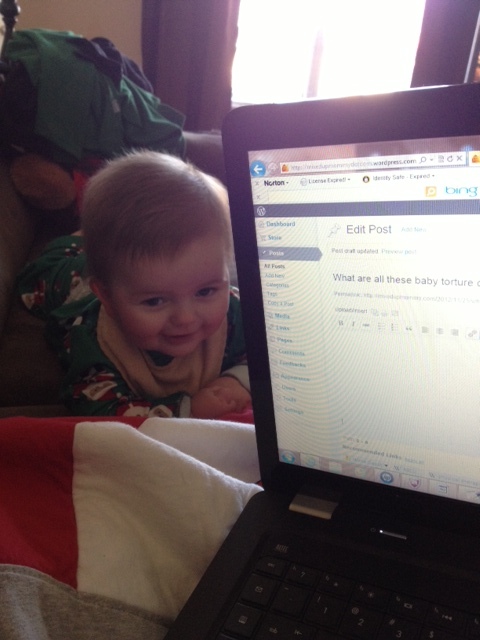 Connor has been on my case about not blogging for several days. He put me to work today. I’ve never tried pilates, yet Connor possesses two pilates balls. In fact, if you inspect the portion of the house that contains his things (and by that, I mean every square inch of the house) you will see many strange looking items. 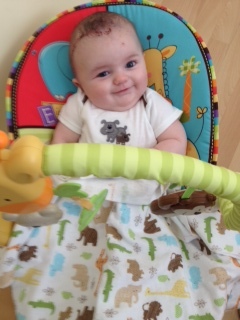 This us because of his physical therapy that he receives via the state of Georgia’s Babies Can’t Wait program. Babies born with certain medical conditions that have the possibility of delaying their development automatically qualify for this program, regardless of the family income level. It means that a physical therapist comes to your home to make sure your child meets their development goals, and if they are behind, try to catch them up. Connor automatically qualified at birth due to having epilepsy caused by his TSC. Although he does have some slight motor delays from the pre-surgery seizures and five weeks in a NICU bed, she has no doubt he will do everything. Basically she comes in with new techniques to help him achieve each milestone more quickly than if left to his own devices, shows us what to do, and we continue the method on the days she doesn’t come. This has led to the proliferation of some weird things littering our living room, something my OCD husband has handled very well thus far. Some are on loan. 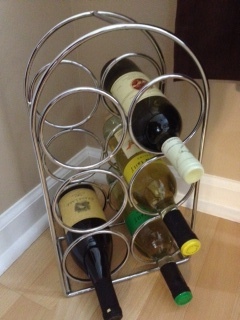 Some we purchased. 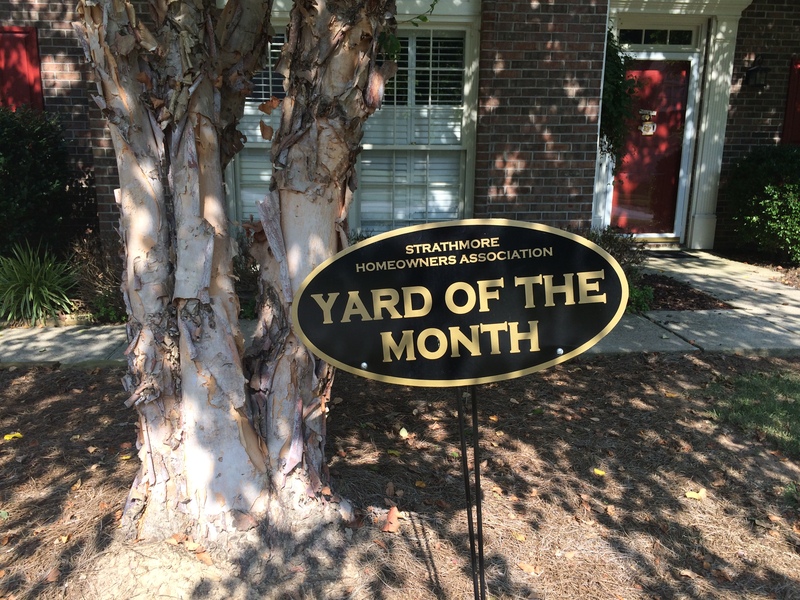 Others involved trips to Home Depot and some sweat equity. 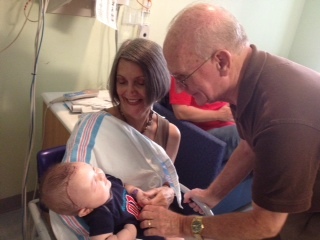 An older shot of Connor and his therapist working on him keeping his head up for extended periods of time. This took him some time to master because of the seizures. Within a week of his surgery, he was killing this skill. 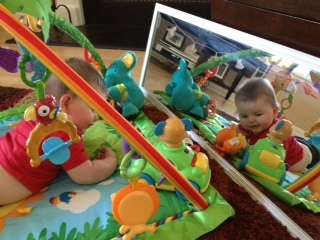 The therapist suggested having a mirror by him because it would motivate him and make him more aware. He absolutely lights up at the sight of himself. No self-esteem issues here. Sherri, the therapist, has also helped us modify some of his toys so he could use them before he was quite ready. He couldn’t touch the floor in his jumperoo so we brought the floor to him, and because he was still building core strength, we rolled a blanket to place behind him to keep him steady. We eventually had to create a more stable platform with phonebooks. He no longer needs the modifications and now he looks like this, although he would like to point out that if I would remove his slippery socks he could do much better. Of course, it was pretty cute when he first started and looked like this. We’re currently working on mastering sitting independently. He can for short periods of time, but needs to work on sitting a little more erectly. But he needs less and less support as time goes on. 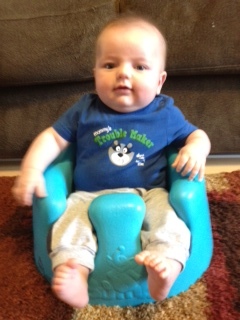 First time in the Bumbo chair before surgery. 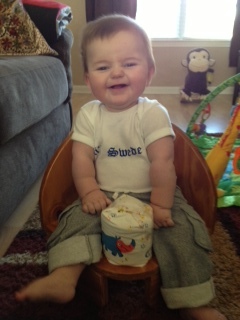 Sitting in his corner chair (on loan from therapist) because it requires him to do more work than the Bumbo. 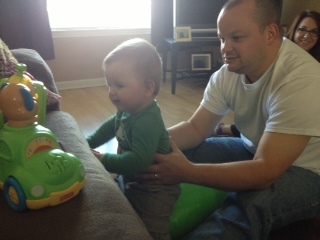 The Boppy pillow also provides him support that will allow him to maintain a sitting position longer. 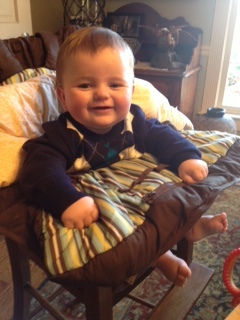 He finally started using a regular high chair on Thanksgiving. This is one of our Home Depot projects. 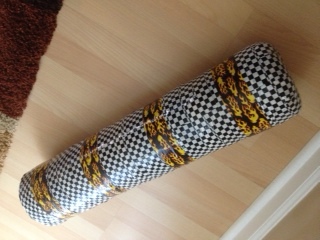 It’s a bolster we use to help him with crawling trechniques, and transitioning from crawling to sitting. Thanks to fancy, overpriced duct tape I was able to give it a race car theme. And finally, here he is doing “pilates.” We’ve used two different sized balls to help him with head lifting, sitting, and leg reflexes. I also tried using it as a chair while watching Judge Judy. I have not pursued pilates beyond that. We hope everyone had a fantastic Thanksgiving! Since Connor was diagnosed at birth as having a seizure disorder, he automatically qualified for the State of Georgia program Babies Can’t Wait. This program is great because it provides physical therapy in your home at a Medicare rate. There is a common misconception in the hospitals that it is free. It’s not, but it is typically covered by insurance. I’m guessing that misconception exists because most people’s insurance covers it. Since they charge the far more reasonable Medicare rates, I would think most insurance companies don’t make an issue of it. If we went for private therapy, we’d have to pay a co-pay, drive him there, and they would charge several hundred dollars an hour. We haven’t had to pay anything out of pocket. And if for some reason, insurance doesn’t cover it, they charge you a fraction of the Medicare rate based on your income. Seizures can impede development because you can’t take in input during one, plus they make you sleepy, so this adds up to less alert time to learn. Connor also has somewhat low muscle tone due to his neurological condition so it takes him a little longer to master a new physical activity than the average baby. (His pediatrician says his tone has improved vastly since she first saw him and it’s not expected to have a major effect on him when he’s older). At his initial assessment, which was shortly after he turned two months, he was placed in the 0-1 month category due to head lag. This means that when pulled to a sitting position from lying down, his head fell back rather than staying even with the body. I already knew he wasn’t lifting his head on par with other babies his age, so I was very nervous. He also spent the first five weeks of life in a hospital bed which didn’t help. So the first goal we tackled in therapy were exercises that would help him strengthen neck and back muscles that would help him hold his head up. 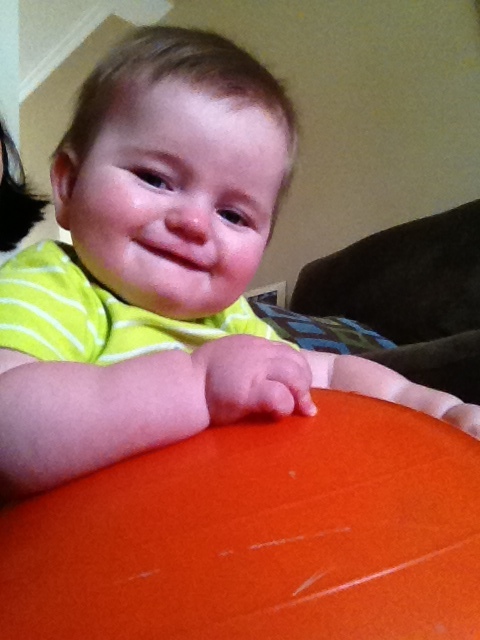 He owned a pilates ball already and I had never even tried pilates. Besides the head, the biggest difference I noticed was how wobbly he was when holding him to my side. 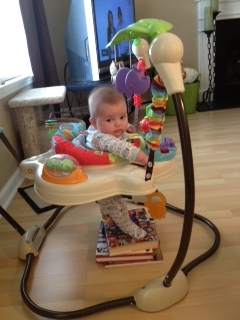 He didn’t hold himself as erectly as other babies, so we also worked on strengthening his core. I was pretty unnerved this whole time though. Even though nobody said this would be his case, I had come across situations in which people had such low muscle tone that they were in wheelchairs or had exceptional difficulty with physical activity. 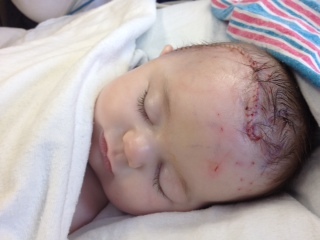 Fortunately, we went forward with brain surgery on July 27. It was performed at Scottish Rite by Dr. Joshua Chern. Oh, we love Dr. Chern. I did not expect a neurosurgeon to have a bedside manner, but he had really blown us away when we met him in the NICU in April. Very approachable and interested in making sure we understood what would be done, as well as the risks. When he tried to show us the MRI, he was unable to retrieve it in the computer system, but instead of just giving us a quick run through so he could go on with his day, he said he’d be back in an hour because he wanted us to see exactly what needed to be done. He was back in about 40 minutes, and not only had he retrieved the MRI, but during that time he had spoken with Connor’s neurologist, as well as called a colleague for consult in another part of the country. Considering I feel like I have to call various medical offices eight times any time I need something medically related done, this kind of proactive go-getting was awesome. The tuber in the right frontal lobe was plain as day and according to the EEG, responsible for 80-90 percent of the seizures. And perhaps removing it would help lessen the few that were coming from the rear left occiptal lobe. It wasn’t too deep and he was confident it wouldn’t have any long term effects on him. It’s location was in a not very vital area, it was on the surface, plus at this age the brain can compensate by using other parts of the brain instead. 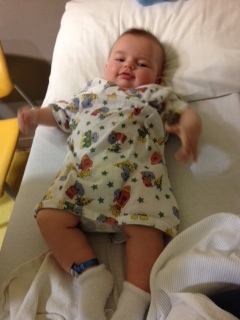 A little after his four month birthday we checked in for surgery at 6 am on a Friday morning. He went back at 8 am for another MRI in the operating room and the surgery was underway by 10. My parents and Chris’s sister came to the hospital for support and as we sat at the lobby Starbucks it became apparent that Chris wasn’t talking. His nervousness was palpable. I can’t really explain why I was as calm as I was (other than that I had started back on my anxiety pills a few weeks prior :). I was the mess during the NICU and Chris kept it together. Now the roles were reversed. Although his version of being a mess is much more pleasant than mine. I was just looking forward to having some sort of resolution finally. Although I will say the backpack full of thank you notes to be written and magazines to be read didn’t get touched. I wasn’t THAT good, despite hourly calls from the OR to let us know everything was going fine. 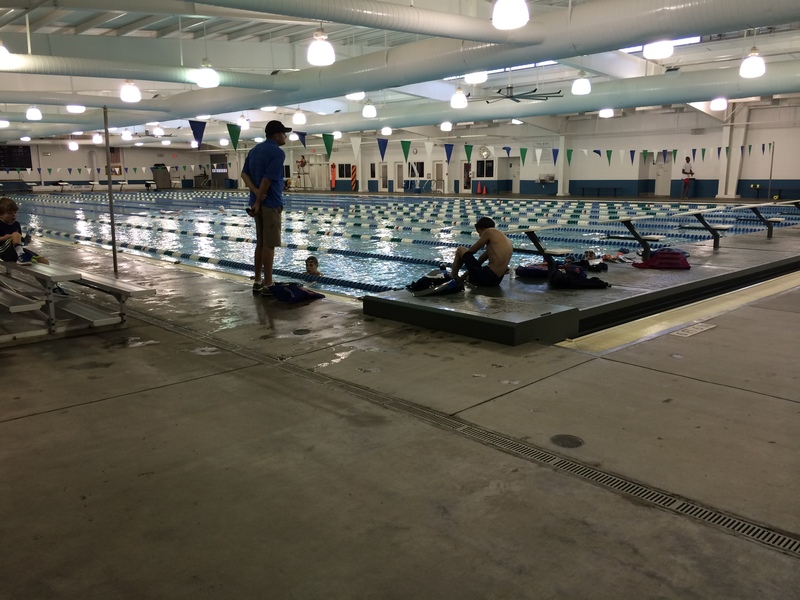 Dr. Chern came to speak with us shortly after one o’clock when they finished. 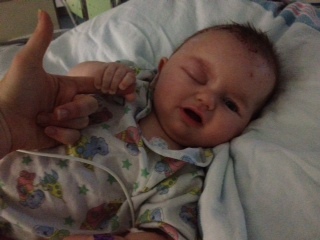 Everything had gone smoothly and the plan was to keep him in ICU that night and on the seizure floor until Monday. And then Connor became a rock star. If you couldn’t see it, you wouldn’t know he’d had brain surgery. I’m a bigger baby over a headache. Surgery? I’d probably be ringing a bell and demanding to be waited on for six months. 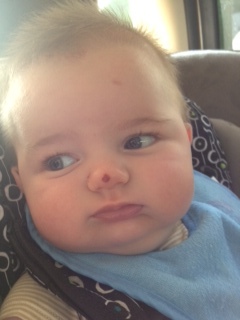 The only time he fussed was the next day when the swelling started and you could see his face getting tight. Once we told the nurse to give him the meds regularly, he was fine (side note: we actually had to tell them to give pain meds to him. 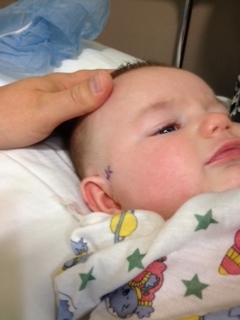 We assumed that would be automatic after drilling into his head, but apparently not). Even then, all he had was tylenol and motrin. Man, even I got percocet automatically for pushing him out. So I spent the weekend sleeping in his room, further mastering my craft of reattaching leads to his chest that would come loose and wake me up every couple hours with their incessant beeping. I relearned what the various alarms meant and which ones I could silence myself as they received no response from anyone on duty. I also enjoyed pretending to be asleep during shift change when the two nurses would peek in and talk about how cute my baby is. And finally, on Monday he went home. 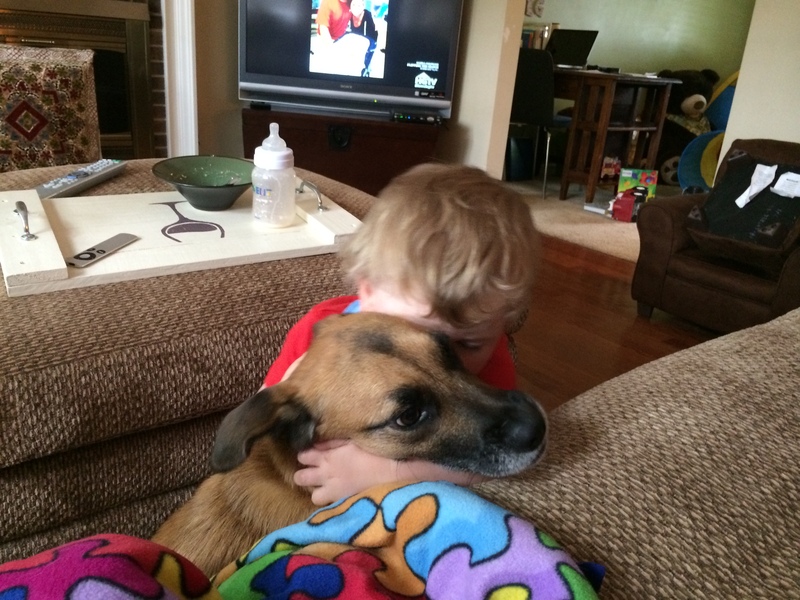 We haven’t seen another complex partial since, and his motor skills picked up immediately. His head was up, his core was steadier, he began to laugh more and an already awesome personality became even more incredible. 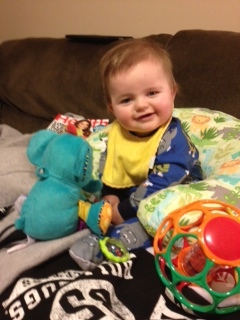 He’s currently six months, getting close to seven months, and he’s well on his way to sitting independently. By the way, I was nursing a headache as I wrote this, but pushed on because my kid has made it clear I’m a big wimp.